I am going to go right ahead and take full credit for the beautiful Spring weather that we are having this week, since I finally did some major spring cleaning a couple of days ago. Or maybe it’s because I finally completed my ultimate guide to the Bahamas, connecting the 3 vacation mini series that I have been posting throughout the month. I really don’t know (but you are welcome). In all seriousness though, I hope you enjoy this post whether you are thinking about your next vacation, looking for genuine tips on how to enjoy the Bahamas to the fullest, or are simply sheet-masking and need a 15-min read to keep you busy. Now, this point is not to be a negative reflection on the hotels and their perks, but more so my personal appreciation for Airbnbs and B&Bs due to their offer of authenticity, unlimited local insight, and budget-friendly rates. In particular, our trip went from a pretty great one to an abso-freaking-lutely amazing one, all because of our Airbnb superhost, Selena (I think of her as a one-woman travel agency that is just killin’ it on all business fronts). It was her Bahamian roots, local knowledge and contacts, and genuine customer service skills that made our trip unforgettable from our first online conversation to our last hug goodbye. Click here to check out more photos, 73 perfect reviews, or just to chat with the wonder woman herself. The Bahamas is made up of 700 islands. Let that sink in for a moment. That’s 700 places that are surrounded by nothing but crystal clear waters, soft white sands, and natural marine life, making up something that we dream about during every Toronto springter (with April’s freezing showers, you should be familiar with that season): a beach. Now, to slightly broaden your imagination, most of the beaches are uninhabited, a couple of them have animals that usually live on a farm, and the rest are tourist-friendly while maintaining their Bahamian culture and charm. Lastly, and when you are done feeling overwhelmed with the options and planning your trip, you can click here for a list of my favourite beaches, what they offer, and how to get there. Don’t have enough bank to charter a boat? Don’t worry, me either, so most of these are public and are located in Nassau. While we did not limit ourselves with regards to food and day trips, we did, however, save money on flights, rented an airbnb, took advantage of local transportation and vendors. While that statement is not new or even shocking to some, it is worthy of being mentioned. Even with my research, colleagues’ shared experiences, and Toronto living, Joe and I still managed to go over budget. The American dollar currency (USD and BSD is at par anyway), the amount of wealth and deep pockets that frequently vacation there (we found ourselves in the awkward “I, too, am shopping for a boat or a plane” conversation, with a guy wearing slip-on loafers, more times than I can count), and the popularity of the Bahamian offshore financial market, should all provide you with an idea of how pricey the vacations are. While we did not limit ourselves with regards to food and day trips, we did, however, save money on flights (setting the google flight alerts for price changes on your preferred dates is a lifesaver, saving us close to $400 total for both), rented an airbnb, and took advantage of local transportation ($2/p bus trip vs. $60 cab ride) and ate at local vendors. Lastly, renting places with kitchenettes and travelling from US (Miami) are some other ways of staying within your budget. While I’ve never been a picky eater, I do place a lot of emphasis on the freshness and flavour of food, enough for it to either make or ruin my trip (I can almost see Joe saying “Amen” under his breath, as our relationship is primarily based on food. Real talk). Needless to say, the Bahamian flavours did not disappoint. With unlimited fresh fish, smoked BBQ meats, and creatively prepared conch, available around every corner, I guarantee that your eyes will always be bigger than your stomach and that there is nothing you can, or should, do about it. So whether you are looking to expand your palate with local conch-related flavours and spices, explore the hidden gems and dive bars, or simply drool over the vibrant photos of food, I have got you covered here with a list of my favourite spots worth checking out. 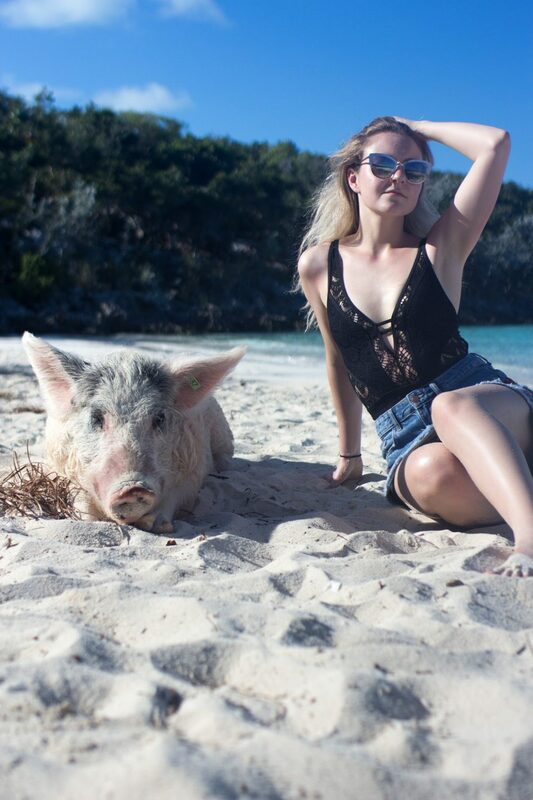 Whether they survived a shipwreck or were left there by sailors for a later meal, these piggies have made one of the Exuma Cays their home, while maintaining a strict schedule of lounging (all day) and swimming (occasionally and only for food). In other words, they are living a better life than you and I. While this day trip was definitely one off the bucket list for me, you can can expect to feed them (bread is the snack of choice), swim alongside them, and hang out beach-side while offering frequent belly rubs in exchange for photos. Similarly, and during the same day trip, you will visit the nurse sharks, where a 6-year old will shame you into getting in the water with these slow-swimming and sand-paper-like creatures without any actual medical training (there is no explanation for their name). Be careful to only touch them on the top, regardless of their sedentary and calm nature, as they still have a snapping bite and, in hindsight, are ranked fourth in bites on humans (but also stick to using common sense and not try to kiss one. Google an idiot that did, though). Click here for the best way to get there and get the most out of your trip. Trip #1 (the swimming pigs + nurse sharks): Flying from Nassau to Staniel Cay for 20 mins to enjoy a private tour, all while skipping the rush of other tourists? Or boating for 143 km with 10+ people to enjoy a much shorter tour during the ‘tour rush hour’ before heading back? Oh, and the only price difference is paying for lunch, as only the latter offers a soda and pre-set main (Yeah, we got boozed up, so option A was more appropriate for us). Click here to plan your flights. Trip #2 (Harbour Island): Paying $20/p more for a 30 min. flight from Nassau to Eleuthera and taking the $5/p water taxi to Harbour Island and enjoying the beach for a full day? Or fast-ferrying for 2.5 hours (sea sickness included), taking a detour involving 2 land and 1 water taxis to only spend 2 hours at the beach before doing that all over again (Yup, did that). Click here to compare flights and here for fast-ferry options. In conclusion, the decision is always up to you, but, as for myself, and after being on both modes of transportation, I will always opt for the faster flight option. This is a self-explanatory ‘don’t’, yet the hardest to follow. Typically, I tend to work more and longer hours prior to any vacation, hence my packing looks somewhat like a rebelling teenager ripping clothes off the hangers and shoving them into a garbage bag, all while threatening to run away. Just as typically, I would end up wearing only 1/4 of the clothes, which, frankly, got very annoying. So, recently, and I mean very recently, I started packing a month ahead. Yes, you read that right. A month ahead. With the first week dedicated to going through my closet for the already-haves, the next two weeks for online and mall shopping for the must-haves and pre-planning outfits, and the last week for completing outfits with last minute accessories, as well as packing skincare and buying everything SPF. I found that this technique has saved me precious time, alleviated stress, and allowed me to plan better outfits. Lastly, click here for my latest style must-haves to pack for your next vacation, which includes items like straw bags and a ribbed two-piece that are on everyone’s hot list right now. If you are overwhelmed by the 700 islands, start in Nassau, as it has beautiful public beaches, unlimited local eateries and bars, and incredible people that will assist you in every aspect of your travel. When travelling to the Bahamas, Joe and I knew where we wanted to go and maybe one or two things that we wanted to do, but consciously decided to leave the rest of the time for exploring the areas around us. For example, with our Bahamian stomping ground and capital, Nassau, we planned to see the Queen’s Staircase (highly recommended for beauty and historic purposes) and relax at the Junkanoo beach. Did we plan on getting lost and stumbling on to Café Matisse, where we would enjoy a lunch in the beautiful garden AND come back for dinner on the romantic veranda? Definitely not, but it sure worked out in our palette’s f(l)avour. In summary, if you are overwhelmed by the 700 islands (I know I was), start in Nassau, as it has beautiful public beaches, unlimited local eateries and bars, and incredible people that will assist you in every aspect of your travel. Lastly, don’t forget to explore on foot and via public transport, as well as plan 1-2 things for the day, as to leave some room for the real adventures in getting lost. While Nassau will always be my first (Bahamian island), a piece of my heart will always belong to the 365 islands of Exuma, even if I had the pleasure of visiting only a handful of them. While I find that comparing different countries (e.g. Thailand, Mexico, etc.) and cities to be almost unfair, as most of them offer different experiences and uniquely cater to each traveler, I do believe that in Exuma the waters are slightly more crystal clear, sand is that much softer and whiter, and nature is that much more beautiful and untouched. Mind you, I have more countries and regions to explore in my lifetime, but for now, and for me, that sentence stands to be true. Thus, provided with the right opportunity, the islands of Exuma, such as Staniel Cay and Great Exuma, are not to be missed, even if you risk planning out your retirement there during multiple times in a day (extra during the ice storm days in Toronto). Now, while highly subjective and understanding of others’ travel companion preferences (e.g. girlfriends, large groups, even solo, etc. ), I refuse to travel with anybody other than the smokin’ stud over here. This is a man who sees right through my “It’s going to be only a five minute photoshoot” lie and still goes with me, puts up with my weird and borderline annoyingly organized travel itinerary, feeds me when I throw tantrums, and instinctively keeps us safe in any situation. His only compromise for my crazy? Lots of great food. That’s. It. It’s actually ridiculous how lucky and grateful I am. In summary, and with an overwhelming amount of trial and error, find somebody who puts up with your sh*t, the good AND bad kind, and with whom you just can’t wait to share your experiences. There you beauties have it. I can’t believe I’ve stretched my one trip to the Bahamas into 5 blog posts and, most importantly, long enough to skip over the cold springter months and straight into summer. Anyways, I hope you enjoyed this little set of posts, coming together for the full and ultimate guide to the Bahamas, and will leave some questions and your own recommendations down below.